Each of us at one time or another have experienced the feeling of being bloated; that uncomfortable sensation where the stomach or intestines are pushed against the skin making the area distended and hard. This is normally caused by an excessive build up of intestinal gas – or wind. Again these are only a few of the things that can cause this problem and there are also a large number of conditions that can cause it to occur, such as Irritable Bowel Syndrome, Crohn’s Disease and Oedema (Fluid Retention). If you are having persistent problems with bloating and gas, it is wise to consult your GP who will be able to advise you on what course of action to take. Sometimes the problem can be nothing more than a normal bodily function that reacts against perhaps a food or liquid that the body is not familiar with. Indeed sometimes it’s completely normal and will occur of its own accord and likewise not occur. 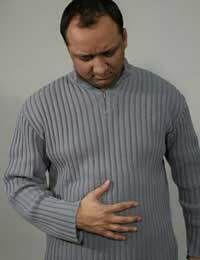 But for those of us who suffer from bloating with any regularity, consulting the doctor is the best way forward. He will be able to diagnose the problem and may suggest changes in diet, lifestyle, etc. Stress and cigarette smoking are also contributing factors, and a combination of the two can exacerbate the problem. For most people the condition is minor one, which will – from time to time – reoccur, but for some it can be a persistent problem that can cause havoc during their everyday lives. In order to try to rectify this, you can look at your daily intake of dairy products, such as milk, cheese, cream etc, and also the amount of food you consume that contains starch, such as bread and potatoes. Overloading your digestive system with high volumes of the aforementioned food can cause bloating and gas and all the effects that go with them, such as pain in the abdomen, problems passing stools and a hardness in the stomach and abdomen areas. Also it is worth noting that this is a problem that can occur if your diet contains a high amount of carbohydrates – starchy or sugary foods taken in large amounts – so if your doctor suggests a revision of your diet, it is wise to consider this as a viable option. Several of the simplest and most effective things you can do to alleviate this problem include not eating while on the move, maintaining an upright sitting position when eating, reducing the amount of carbonated drinks you consumed, reduce the chewing of gum and indeed, as perhaps silly as it sounds, chewing with your mouth closed so that you are not taking on excess air. In addition, it is worth taking the time to sit down at the dining table and enjoying a meal properly. You will find that not only will the problem of bloating and gas be reduced – if not cut out altogether – but you will most certainly enjoy your food more. To understand more about your digestive system, you may be interested to read our features How Your Digestive System Works and Improving Your Digestion With Functional Foods. Is there a system of eating out there which will help me to lose weight given I have an underactive thyroid. I am 11st7lb and am only 5ft2inc tall and am 64yoa but until 7 years ago I was 9st. I was left with a borderline underactive thyroid for 3 years until I became distressed about my unreasonable and undeserved weight gain and was then medicated but too late, the damage was done and though I am not eating for Britain, I look as though I do.PLEASE HELP ME. It's something we all suffer from every once in a while, and rarely eating foods that cause gas can help as can cutting down on carbonated drinks of all sorts, and this includes lager. That's highly carbonated and can cause a great deal of bloating, especially if consumed on an empty stomach (which will also make you more drunk). Moderation in all things will help, as well as drinking and eating sensibly.